The Holistic Birthing Center at UH St. John Medical Center is Northeast Ohio's first hospital-based holistic birth center. We believe that birth is a sacred, natural journey that can unfold on its own. And we are here to help make this experience possible for you, your newborn and other family members. As a hospital-based holistic birthing center, we provide a unique environment that closes the wide gap found between home birthing and traditional hospital birthing suites. Our program of care is designed in the wellness model and guided by principles of prevention, sensitivity, safety, and appropriate medical intervention. We help to establish an intimate connection through personal prenatal care between the mother, the family and the midwife, enhancing the power to give birth that lies within each woman. We also help empower the family to assume an active role in the birth of the baby. Another important difference you will find at our Holistic Birthing Center is that there is rarely any separation between mother and baby, unless unexpected complications arise. All treatments and exams are done in front of the parents so that they may learn more about the baby. Continuity of care is ensured because the same staff takes care of the mother and baby together. Our Holistic Birthing Center was designed for healthy, low-risk mothers and healthy babies. Birth is a normal process and intervention is typically not needed for healthy mothers. However, unlike natural childbirth at home, the Holistic Birthing Center offers the safety net of around-the-clock pediatric and obstetric physician coverage. During a recent focus group, most women reported the desire to have a natural birth in a hospital setting to avoid any "what if" factors. Our Holistic Birthing Center is linked to an acute care hospital to ensure that we can get a mother or baby the care they need should any complication develop. 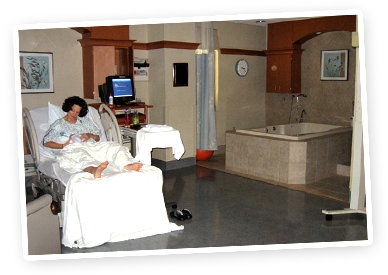 The Holistic Birthing Center is located adjacent to UH St. John Medical Center's Nursery and Family Birthing Suites.